The Principality of Liechtenstein is a landlocked alpine country, bordered by Switzerland to the west and south and by Austria to the east and north. Its area is a little over 62 square miles. In ancient times, this geographic area was part of the Roman province of Raetia. For many centuries this mountainous area had little impact on European history, as it was geographically removed from any strategic European interests. The House of Lichtenstein, from which the principality takes its name, comes from Castle Liechtenstein in Lower Austria. Through the centuries, the family acquired vast tracts of land, predominantly in Moravia, Lower Austria, Silesia, and Styria. These land holdings were all administered by feudal lords under various lines of the House of Hapsburg, with the princes of the House of Liechtenstein serving as close advisers. The House of Liechtenstein purchased the Lordship of Schellenberg and the County of Vaduz in the early 18th Century. After the acquisition of these new lands, the family had acquired enough political status for their combined lands to become a sovereign territory. On January 23, 1719, Holy Roman Emperor Charles VI elevated the status of the newly formed territory to that of a Principality with the name "Liechtenstein" in honor of the sovereign prince of the House of Liechtenstein. Liechtenstein joined the German confederation in 1815, which was presided over by the Emperor of Austria. In 1818, sovereign Prince Johann I granted the territory a limited constitution. That year also saw the first visit of a member of the House of Liechtenstein to the new country, Prince Alois; however, the first visit by a sovereign Prince of the House of Liechtenstein would not occur until 1842. 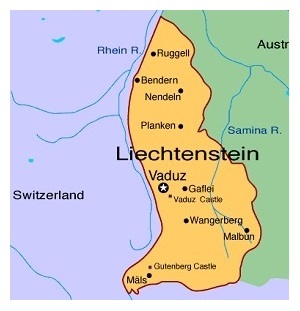 Until the end of World War I, Liechtenstein was closely tied first to the Austrian Empire and later to the Austro-Hungarian Empire. The economic devastation caused by World War I forced the country to conclude a customs and monetary union with its other neighbor, Switzerland. This was a crucial alliance, considering the degree of havoc that would soon be engulfing all of Europe. Until 1938, the princes of Liechtenstein lived in Vienna and in Moravia. In 1938, following the annexation of Austria by NAZI Germany, Prince Franz Joseph II became the first sovereign prince of the House of Liechtenstein to actually reside in Liechtenstein. During World War II, the Principality of Liechtenstein remained officially neutral, looking to neighboring Switzerland for assistance and guidance, and family treasures within the war zone were taken to Liechtenstein for safekeeping. After the end of the war, Czechoslovakia and Poland, seized what they considered to be German possessions, thus expropriating the entirety of the House of Liechtenstein's hereditary lands and possessions in Bohemia, Moravia, and Silesia. The expropriations included over 618 sq miles of agricultural and forest land and several family castles and palaces. In dire financial straits following the war, the House of Liechtenstein often resorted to selling family artistic treasures. However, during the decades following World War II, Lichtenstein prospered, as it used its low corporate tax rates to draw many companies to the country. Today, the sovereign Prince of Liechtenstein is the world's sixth wealthiest leader, and the country's population enjoys one of the world's highest standards of living. Every philatelist should be familiar with Liechtenstein. Take a look at the very bottom of your Showgard stamp mounts package. It is manufactured in the Principality of Liechtenstein!